This time around, the reward comes in a recipe for you. 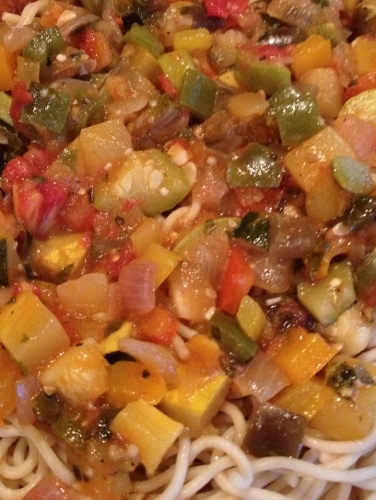 This is the simplest and quickest way to make ratatouille that I have tried. I have made a version that took over an hour to make. If I followed the directions, I ended up with something that more closely resembled a chunky marinara than ratatouille. This recipe recipe is a less saucy result. Enjoy it over pasta or on a toasted gluten-free baguette. Using a large, deep skillet, heat olive oil over medium until hot. Add onions and garlic to the oil, cooking until onions are starting to caramelize, about 7-9 minutes. Add eggplant and thyme to the mixture and continue cooking over medium. Stir occasionally. When eggplant is partially cooked, about 5 minutes, add the green, red and orange/yellow peppers and both colors of zucchini. Cook for about 5 more minutes. Add tomatoes, basil, parsley and salt and pepper to taste. Cook for 5-7 more minutes, until the vegetables have reached the tenderness that suits you. 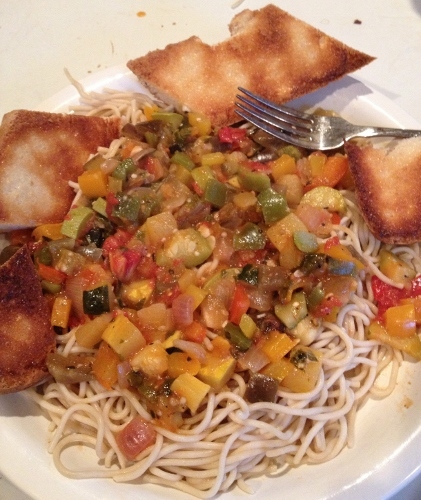 Serve hot atop a bed of pasta or hot or cold on gluten-free bread.